Development of the Gwadar Port on Pakistan’s Makran Coast on the Arabian Sea has been in the news off and on since the project took a concrete shape in the late 1990s. Meanwhile, thousands of kilometres to the North, across the entire length of Pakistan, then across the Pakistan occupied Northern Areas of the Indian state of Jammu and Kashmir, and finally beyond there to the Western Province of Xinjiang in China, another development of monumental proportions had already taken place – that was the opening of the Karakoram Highway for commerce, in 1986. Since then, both these Sino-Pak joint venture among the two formally declared ‘all weather friends’ have continued to generate considerable interest among the strategic community who focus on the South and West Asian region. 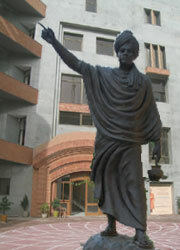 However, it was only recently, following the turmoil that engulfs the region of Pakistan, Afghanistan and beyond, that the two apparently distinct events crystallised as parts of a grand design of immense geo-political implications, both encouraging and worrisome, depending on which side the observer pitches for and as to how one is inclined to come to terms with it. This paper argues that development of the Karakoram Highway and the Gwadar Port had ever been but two ends of one strategic initiative to pave the way for China’s emergence as a world power. Further, it is argued that the overland ‘axis’, connecting China’s core areas, through her peripheral provinces, to the strategic outlet at the Gulf of Oman, is but a complimentary version of the sea connectivity between China, through the Indian Ocean and its littoral states, to West Asia and beyond to Africa – two arms of a strategic ‘jaw’, so to say. Down the ages, successive Chinese empires had exercised varying degree of control over the East Asian landmass that is bounded by the great Mongolian Steppe to the North, the China Sea to the East, the Indo-Tibetan high-altitude Plateau to the South and the East Turkmenistan region of Central Asia to the West. Historians therefore are inclined to view the extent of the Chinese empires under three distinct categories, viz, the ‘core’ area of predominantly Han ethnicity, the ‘cradle’ area of Chinese civilisation and the ‘peripheral’ or the outlying areas. The last named is the general area West of the Hwang Ho River. This is a desolate region, bounded by rugged mountains going up to an average altitude of 4000 metres and cold high altitude deserts. 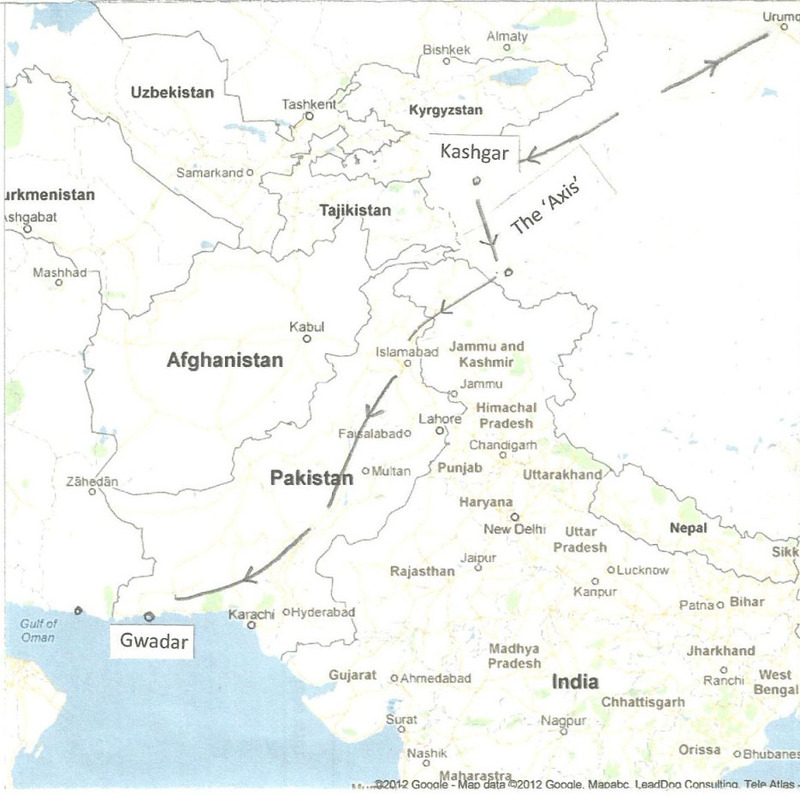 The region is inhospitable to human settlements except in small patches along a narrow ‘Corridor’ that runs East-West connecting the Hwang Ho River Valley to where territories of Tajikistan, Afghanistan (the Wakhan Corridor) and Pakistan lie within 250 kilometres of each other. With the highlands and climate prohibitive to human settlements, the ‘peripheral’ areas were traditionally treated as the nature’s barren land, an ‘open-to-all’ ground for international transit for trade and religion, and controlled by local overlords, who many a times accepted Chinese suzerainty for expediency till they could gather enough muscle to repudiate the superficial allegiance. Thus, during the course of three millennia past, five of the six of the most powerful Chinese dynasties had enjoyed varying forms of jurisdiction from time to time – sometimes formally, otherwise notionally or none at all - over this vast and desolate landmass. Then there were long intervening periods when the empire’s rule shrunk just to the Hwang Ho and the Yangtze River Valleys, smaller independent kingdoms reigning over the rest. Indeed, the extent of territories over which China’s ruling dynasties imposed their control in various forms, went through cyclic expansions and contractions throughout the history, as dictated by the political and military power at their disposal. Point to note is that even at the best of times, the Chinese jurisdiction over what today are the provinces of Gansu, Quinghai and Xinjiang was geographically confined to a narrow, relatively habitable and fertile ‘Corridor’ that run East from Lanzhou, through Urumqi, to its Western terminus, Kashgar. 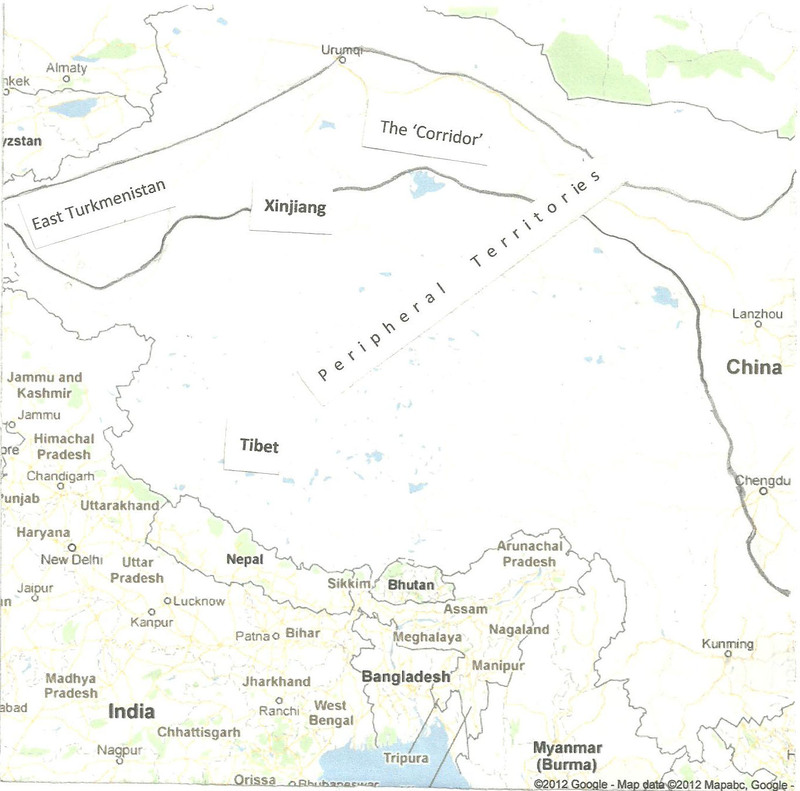 Yet, it is the control over this ‘Corridor’ that sanctifies China’s present day territorial sovereignty over the desolate mountains of the Kun Lun Shan and Tien Shan and the Takla Makan Desert – most of the ‘peripheral’ area, to be concise. As China became a republic in 1911, first under the Guomingtang and then finally under the Communist rule in 1949, she continued to consider the largest territory, more or less, that constitutes the aforesaid ‘peripheral’ area - inclusive of Manchuria, Outer Mongolia and Tibet - that was ever under any form of imperial China’s control, even influence, as her sovereign territorial jurisdiction. As a corollary, the above mentioned ‘Corridor’ – Lanzhou to Kashgar – became the power-arm of her claim over the ‘peripheral’ areas. Concerned over the historical fact that control or its loss over the peripheral territories had ever been synchronous with the rise and fall of Beijing’s state power, the modern era Chinese strategists are very sensitive towards the sanctity of this territorial jurisdiction. In fact, these territories are seen as a plank of China’s statehood, and explains her extreme sensitivity to the rebellious ethnic inhabitants, particularly the independent minded Uyghurs and the Tibetans. Indeed, the traverse of this ‘Corridor’ sustains China’s control over the remote, ethnically and religiously different territories at her peripheral out-back. Later, as we shall see, contemporary geo-politics has made this ‘Corridor’ even more significant to China’s access to world power status. The route along the East-West ‘Corridor’, connecting China’s ‘core’ area to Central Asia, had been trod over since times immemorial. This was also the main ‘silk route’ during the middle ages. During the later part of Nineteenth Century and the early Twentieth Century, parts of this route was gradually developed for motorable and rail traffic. After the Communist takeover at Beijing (Peking as it was called then), one of the first matters that drew their attention, besides the ‘integration’ of Tibet, was to further develop the road and rail communications over this ‘Corridor’, extend the roads branching off to the areas to the North and South of the ‘Corridor’, and so enforce their rule over these ‘peripheral’ areas. Thus by the mid-1950’s, the ruling-arm of China was well in control up to the Western limits of her East Turkmenistan – now Xinjiang – territory. China’s decision to patronise Pakistan and start construction of the Karakoram Highway in 1959, to connect Kashgar to Islamabad, was a strategic master-stroke. It is not known whether it was a foresighted grand design devised by the Chinese geo-strategists - given her traditional wisdom, it could well be the case – or was it an event favoured by providence. The case for grand design becomes more apparent when viewed alongside her assumption of control over Pakistan’s ‘gift’ of India’s Shaksgam Valley (gift of a stolen item!) and surreptitious occupation of the Indian territory of Aksai Chin to provide depth to her yet intended ‘axis’ to the Arabian Sea – her geo-strategic ‘Corridor of Power Projection’ so to say. Whatever be the case, the fact remains that these decisions stand vindicated as a welcome stepping stone towards realisation of China’s dream of regaining her ‘Middle Kingdom’ status in the world. Completed in 1979, the 1300 kilometre Highway takes off from Kashgar, crosses over the Karakoram Ranges through the Khunjerab Pass (15,400 feet), and skirts past the Nanga Parbat to run down along the Indus River Valley via the Pakistan occupied settlements of Hunza, Gilgit and Chilas. Emerging at the foothills of Abbotabad, the Highway finally meets the Islamabad – Peshawar – Kabul Road at Wah, strategically one of the two most significant communication hubs in central Pakistan. Added with alternate crossing over the Mintaka Pass and widened to 10 metres, the Highway was opened for commercial transportation in 1986. There is survey going on to lay a rail link astride this alignment which, demonstrative of the Chinese culture, is certain to be executed in good time. Since 2006, China has started work to further upgrade the Highway to six-lane specifications. It is on the strength of this Highway that China is a power for Kyrgyzstan, Tajikistan, Afghanistan, Pakistan, Iran and India to contend with. It is this Highway that has actually found China her military foothold in the Pakistan Occupied Kashmir – a very significant event indeed. Obviously, it is only a matter of time before this ‘Corridor of Power Projection’ plays a major, if not dictatorial, role in the Indian Sub-continent and its neighbourhood. If the construction of Karakoram Highway was a contemporary version of the ‘Great Game’ of the mid-Nineteenth Century, its connectivity with the Gwadar Port on the Makran Coast of Pakistan’s Balochistan Province is a game even greater. A small port-township of geographical significance, Gwadar was transferred to Pakistan by Muscat in 1958. Situated close to the Strait of Hormuz – the energy life-line of South and East Asia – and one hour’s drive from Pakistan-Iran Border, it had earlier served as a port of call for sea traffic steaming from Britain to her South and East Asian Colonies. During the 1971 Indo-Pakistan War, the Karachi based Pakistan Navy took shelter here to avoid the marauding Indian Navy and Indian Air Force, and thus struck the idea of developing Gwadar as a major port and a commercial hub, and of course, a naval base. Construction work was however slow to take off; it picked up pace in 2001 with China’s technical and financial assistance and started operation in 2008. A network of high classification roads connect Gwadar with Karachi, and through the Indus Valley Road to Western China and beyond. Presently, with one set of global issues coming upfront with Afghanistan and Iran, and another set of issues to contend with in the Central Asian States, the geo-strategic importance of Gwadar – and its Iranian counterpart, Chabahar - is mind boggling. China has officially repudiated any suggestion of her eyeing Gwadar as a naval base for the ‘People’s Liberation Army Navy’ (PLAN). But the Chinese logic has a way to find synonymy in opposite meanings – a ‘naval facility’ could just do as much as a ‘naval base’. We have so far discussed the significance of the East-West ‘Corridor’ as an artery of China’s state-power over her ‘peripheral’ territories. We have also appreciated the role that the Karakoram Highway would play in regional affairs related to the Central and West Asia, thus upgrading the ‘Corridor of Power’ to a ‘Corridor of Power Projection’. Now, with its seamless connectivity to the Gwadar Port, this great ‘Axis’, traversing from East China Sea Coast to the mouth of the Gulf of Oman, would pave the way for China’s bid for world power status. Let us briefly see as to why it should be so. The great overland ‘Axis’ connecting the ‘core’ areas of China to the Persian Gulf elevates China’s reckoning in geo-politics to a very significant level and offers great possibilities – good or bad as one chooses to view it – in regional matters. On a positive note, Kyrgyzstan, Tajikistan, Afghanistan, Pakistan, Iran and India could be its direct beneficiaries through trade, tourism and harnessing of natural resources including energy, water and strategic minerals. No doubt, this ‘Axis’ could transform the poverty-ridden societies into happy ones, thus bringing about a state of regional inter-dependency for common good. Besides, it could only be a matter of time before the circle of beneficiaries could expand to include the West Asia-Middle East and the South-East Asia neighbourhood, and finally, attract the Western Powers in their quest to retain the economical lead that their societies have become so used to. The lead player in all this would, of course, be China on her way to her elevation to world power status that she is so keen to assume. Currently, China continues to conform to showcase her rise to be a ‘peaceful’ one which may not cause any apprehension amongst her regional neighbours. It is averred that in the coming decades, the overland connectivity from Gwadar to Lanzhou and beyond would satiate China’s ever increasing demand for energy and raw materials. In other words, flow of resources from Africa, West Asia and Central Asia into China would dominate the role of this ‘Axis’. However, it is becoming apparent that the period of marking time till her economic and technological rise is firmly in place - in conformity to Deng Xiaoping’s ‘24 Character Strategy’ to “keep cool ..., be composed ..., hide capabilities and bide time ...“ - is nearing its end. This is evidenced by a growing school of hard-line strategist who cannot restrain themselves from adopting rather assertive, even threatening stance towards her neighbours on China Sea, Tibet and Indian Ocean. Given the Communist China’s affiliation to her imperial culture that is dictated by a sense of supreme superiority and predatory tendencies, there is every possibility that the Lanzhou-Gwadar Axis may turn out to be China’s hegemonic tool, an axis of political machinations, economic cartels and military arm-twisting. Therefore, rather than just being a conduit for inflow of resources into China, there is every possibility, nay certainty, that the ‘Axis’ would also transport China’s military belligerence the other way. Attraction of the Western Powers towards this region, as mentioned above, could also lead to emergence of ‘client states’ - as Pakistan is to the United States and China – that would add to the sinister competition. Inevitability of such a situation is a lesson of history. This discussion would remain incomplete unless we look at another development of landmark dimensions – that is China’s quest for a position in the Indian Ocean. Indeed, the initiatives taken by her in finding footholds for her ‘peaceful’ shipping lanes, that is, her energy life-line, has generated much discussion – and subtle consternation - among the littoral states. No doubt, a situation wherein a blue water PLAN would majestically impose over the Indian Ocean while enjoying logistic facilities from the string of friendly ports – commonly referred to as the ‘string of pearls’ around the peninsular India – is yet far away. But it is inevitable. Seen in wider perspective, the aforementioned Lanzhou-Karakoram Highway-Gwadar Port Axis appears to be an upper jaw while the ‘String of Pearls’ is the lower one, with mainland China as its pivot and the Gulf of Oman in its mouth. Between these two lie a host of nations trying to lift themselves up from a state of under-development. As to how this gigantic ‘Jaw’ would come handy in promoting harmony, development and friendship, or would it be used as a geo-strategic lever to torment smaller neighbours, is to be seen. Whatever be the case, the Karakoram-Gwadar connection is a significant geo-strategic development. The soul of the Tang Dynasty General Gao Xianzhi, defeated by the Abbasid army in the Battle of Talas in AD 751, that put paid to China’s territorial expansion to the West Asia, may now be pleased! Geo-Strategic developments are always twin purpose tools. If harnessed sagaciously, the Lounzhou-Gwadar Axis could make the region a better place to live. But alas, in the cauldron of international politics, noble considerations are invariably subsumed by a greed for more power, more consumption – and that at the cost of others. That is probably in human nature. But whatever be the case, as history teaches us, it is always advantageous to protect one’s peace and development by diplomatic arguments that is backed up with a stern military countenance. Whether India is getting ‘surrounded’ or ‘embraced’, depends on her strategic wisdom.